The Puzzi 10/1 from Karcher is ideal for smaller carpeted areas in offices, shops and is also a favourite amongst car dealers for valeting. For further information please contact our office on 01473 636663. 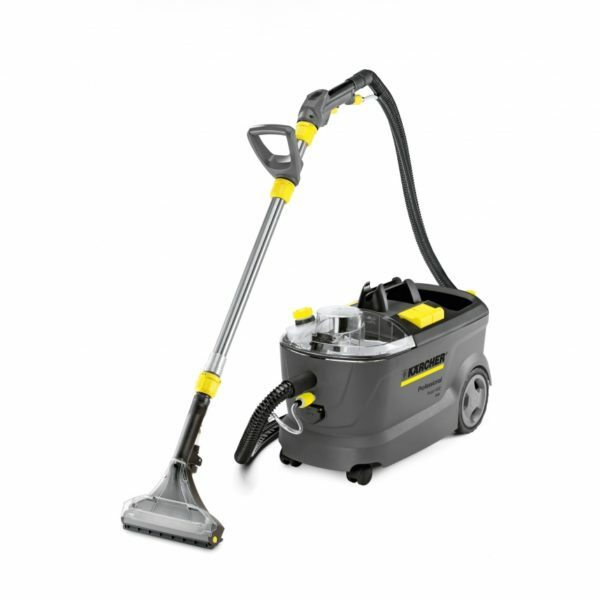 The Puzzi 10/1 from Karcher is ideal for smaller carpeted areas in offices, shops and is also a favourite amongst car dealers for valeting. The rubber mounted pump and fan module not only offers very quiet operation but are also very service-friendly. The waste water tank simply lifts out for easy disposal of dirty water and its clear Perspex lid allows you to monitor dirty water recovery. The Puzzi 10/1 also benefits from having a de-foaming tank, thus ensuring maximum use of the dirty water recovery tank and also offers twice the spray performance thanks to its twin delivery pumps.